In RED is WHY it is designed to FAIL! 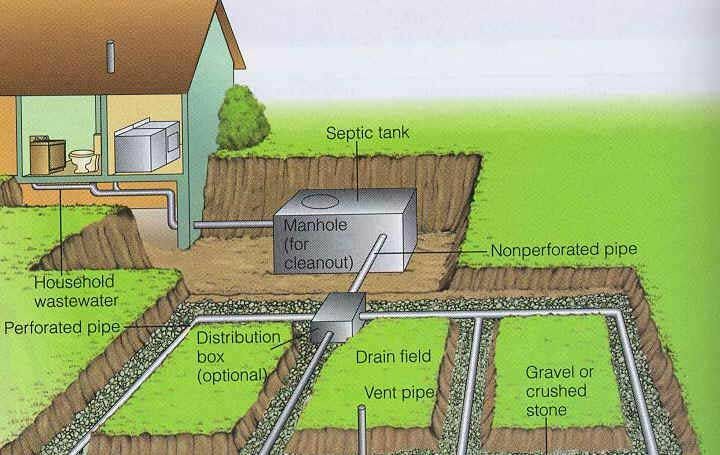 A septic system has two key components: The Septic Tank: A container usually prefabricated from concrete. It receives waste water from your bathroom, kitchen and laundry room. #1 YOU SHOULD NOT HAVE ANY SOAP GOING INTO THE SEPTIC TANK! A properly design system should have a separate dry well for sink, shower and washers(Septic system failure remedies, Bio Drain and Septic Cleaner). Heavy particles settle at the bottom as sludge and light materials float to the surface of the tank forming a scum layer. Bacteria in the system help to break down and liquefy the organic matter, which is carried to the disposal field as effluent. #2 SOAP KILL’S BACTERIA! Once Bio Drain ans Septic Cleaner is put into the system, organic matter is broken down and never returns to a solid. Other product’s brake down solids, but they go back to a solid, NOT GOOD! A septic tank should be sized to allow enough time for settling of heavy particles and flotation scum. The partially treated effluent then flows from the septic tank to the sub-surface disposal area. The Leach Field: This consists of a distribution box and perforated distribution lines (laterals) installed below the ground in gravel beds or trenches where further treatment filtering action takes place. Seepage pits can also be used in some places. Septic systems must be designed and installed to meet standards established by state law, and in some instances, local ordinances. Septic Systems are designed and installed to NJDEP regulations and, in some instances, local ordinances. These regulations require testing of the soil to determine its permeability. Various tests can be conducted, including tube parameter, percolation test, basin flooding, pit-bailing or soil permeability class rating. When designing a system, an engineer checks the level of the water table to ensure that it is at the required distance below the bottom of the disposal area. The size of the disposal area is based on the number of bedrooms in the home. Any home improvements, including pools, sheds and remodeling with in the home will require a Construction Referral Permit and review by the Hunterdon County Department of Health. Caution: Gases generated within the septic tank can accumulate to toxic concentrations which have been fatal to humans. No person should ever enter a septic tank or even just peer into the tank through a manhole cover without exercising extreme caution. 1: Cut back on household usage – fix leaky faucets and toilets, and don’t flush the toilet unnecessarily. Install low-flow fixtures for shower-heads, toilets, etc. #3 NO SOAP, KILLS BACTERIA! 2: Limit the amount of cleaning agents that you use. They can be harmful to a septic system if used in excess. #4 WHO CAN LIMIT THE AMOUNT OF CLEANING AGENTS YOU USE? KILL’S BACTERIA! 3: Space your showers, laundry and dishwasher loads, allowing your system to ‘rest’ between high-volume uses. #5 THIS IS REALLY FUNNY, ALL OF 3! 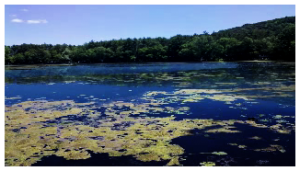 4: Never allow toxic and hazardous chemicals to be disposed of through your septic system. This includes paint thinner, surplus paint, oil, gasoline or grease. #6 WHO DOES THIS IN REALITY? KILL’S BACTERIA! These items should be saved and disposed of at the Hazardous Waste Days sponsored by the Hunterdon County Solid Waste Department (see last page). 5: Limit paper products to the absolute minimum and use white toilet paper to avoid product dyes. #7 AVOID PRODUCT DYES? FUNNY? Do not put coffee grounds, disposable diapers, sanitary napkins, tampons, cat litter, baby wipes and cigarette butts through your septic system. designed for a garbage disposal. 7: Avoid using septic system cleaner additives. #8 CLEANER ADDITIVES YES.WHO DOES THIS? They are not necessary, and some can interfere with the natural bacterial action of your system. #9 WHAT NATURAL BACTERIA WITH ALL THE SOAP GOING IN? A GOOD BACTERIAL ADDITIVE IS ABSOLUTELY NEEDED. accumulated sludge. #10 IF THE SYSTEM IS WORKING PROPERLY YOU SHOULD HAVE MINIMAL ACCUMULATED SLUDGE! Pumping extends the life and efficiency of your system. All solids should be removed as part of this pumping procedure. Pumping frequency should be increased for older homes with tanks less than 1,000 gallons. 9: Water softeners must not drain into the septic system without approval by the design engineer. #11 WHO HAS THIS IN THEIR HOUSE, I PERSONALLY KNOW MANY PEOPLE WHO DO HAVE WATER SOFTENERS. SALT IS A MAJOR KILLER OF BACTERIA! 10: Prior to any septic system modifications (including repairs, alterations or new installations), a permit is required by the County Department of Health. 1: Know exactly where your septic system is located – before you have trouble. If you can’t locate it, ask a neighbor, the previous owner or your builder to help you find it. You can also check the records at the Department of Health. If no design records are available, the Department will refer you to other professional resources. 2: There should be no visible effluent, septic odor, or backup into the house. These warning signs indicate a problem may exist. 3: Direct roof drains and sump pump discharges away from your disposal field. Septic systems do not work well if you overload the drainage field. REALLY? 4: Do not physically abuse your septic tank or disposal field by parking vehicles or placing permanent structures (such as above ground pools, decks, or driveways) over the area. Check with the Hunterdon County Department of Health for proper setback distances. 5: Keep trees/shrubs from growing on or close to the disposal area. This will prevent roots from clogging the distribution laterals. 6: Effluent filters in your septic tank need to be cleaned according to manufacturer specifications. 7: When you have your system pumped, the Hunterdon County Department of Health recommends you install a concrete riser, with locking lid, that is level with the ground. This will make checking and pumping the system much easier in the future. Absolutely add a bacterial product like Bio Drain and Septic Cleaner to keep your system free from having to replace in any near future. Both products add beneficial bacteria, reduce sludge build-up clean field line and drain line in the house. We have proven results across the country. Both out products also reduce GAS build up in the tank.